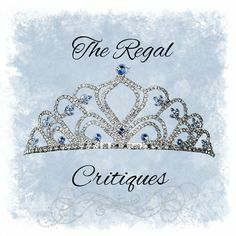 The Regal Critiques: #DiversityDecBingo Wrap Up & #DiversityBingo2017 Announcement! Loved it! The descriptions were done exceptionally well, with much importance being given to the history, background and setting, and ah, I loved it all! There was just so much packed into the narrative that it was a little bit confusing at times, but I loved how everything turned out in the end. Nothing much to be mentioned in terms of romance- well, there's a love triangle here which wasn't all that bad, but perhaps unnecessary? But I didn't mind it, there was just so much else going on that romance did take the backseat and I'm not complaining! A must read if you're interested in a diverse book written by am author of Malay descent, that's highly descriptive and accurate in terms of history and culture of Malaya (Malaysia)! This book clearly shows I should have waited before curating all those lists of my favorite authors and books of 2016. How mind-freaking-blowingly awesome this was! Deals with sexuality, racism and more! Loved the characters to bits, and Frances was so ME!!! Honestly can't get this book out of my head, it was so good. Such a beautifully written story! I loved Melody, I loved how realistically her experiences were portrayed and I just loved this book overall! A must read if you're on the lookout for a well-written book about a kid with a disability (cerebral palsy, in this case) in the most witty of voices. The one thing I wish everyone understood is that experiences are unique- you can't simply expect a character to stick to what you know of a disability/mental illness. Each person is unique, and so are their struggles and circumstances, and I think this book did a damn great job at narrating what Melody went through! What I loved most about this book is the setting, the descriptions and the overall feel it gave throughout. Mermaids, the ocean, tarot cards and sea food- this was amazing. I must admit I had quite a rocky start, though- I had to read the first chapter all over again even when I was in the middle of the story to properly find my bearings, and that is the only thing I can find fault with this book. I wish the start had been a bit more coherent? But I'm glad I persevered because- amazing characters and writing aside- this book teaches that you matter, and your voice matters. Totally recommended! This was all kinds of awesome! I immediately took a liking to the narrator, Junior, and be forewarned that you may not like the story as much as I did if you don't like the quirky way this is narrated. With lovely cartoons sprinkled throughout, this was a truly heartwarming take on racism, hope and hope. Just read it for yourself and see how fantastic this is! I was so very happy with how diversely #DiversityDecBingo made me read that when I saw that the same lovely people were going to have something similar for all of 2017, I immediately decided on taking part! 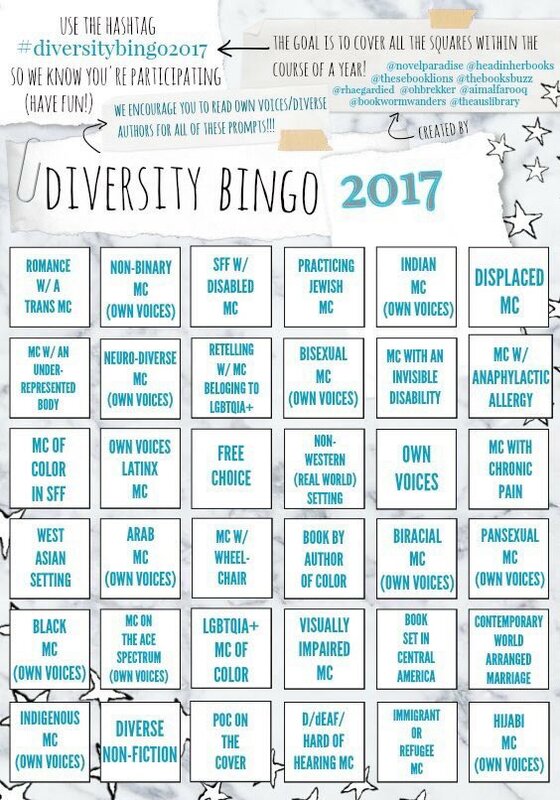 #DiversityBingo2017 aims to make readers read very diversely indeed by putting forward 36 prompts- you can see them in the image below- and the goal is to cover all the squares within the course of a year! Sounds pretty taxing and ambitious, especially since I initially planned on only reading 25 books in 2017 due to this being my final year at uni, but these all sound so exciting that I just can't bear to not take part! Fingers crossed for a successful reading year! What about you? What are your reading plans for 2017- do you hope to read more diversely? I loved The Ghost Bride. I'm so glad you liked that one too. I found it so lovely, and I sort of fell in love with the dragon. Even if you didn't get to read as much as you wanted to, I'm happy for you that the books you did read turned out so well. As much as I desperately want/need to start in on some more diverse books, I tend to have VERY mixed results. But, anyway, The Ghost Bride sounds really cool and I'm going to go check it and Radio Silence out.